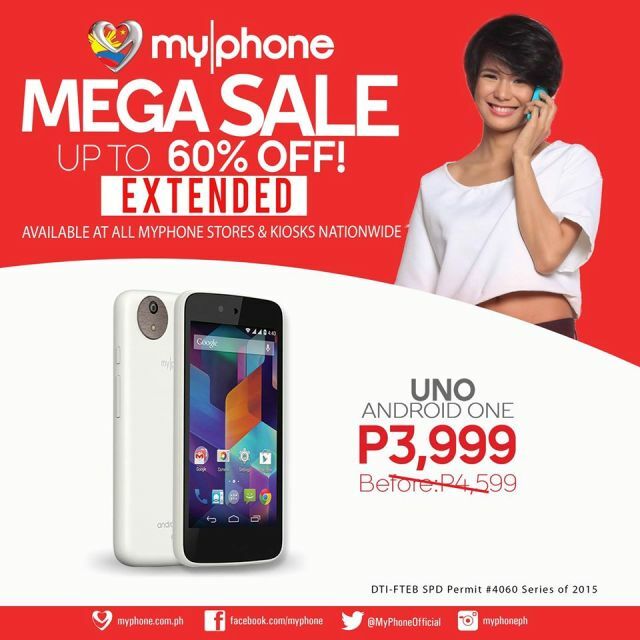 MyPhone Mega Sale is extended where you can get up to 60% off the price. MyPhone Uno now sells for Php3,999 from Php4,599. MyPhone holds its biggest Mega Sale wherein you can get as much as 60% off the price. One of the devices at stake is the MyPhone UNO Android One smartphone which is now selling for only PhP 3,999 from Php4,599. And if you’re living under the rock lately, Android One hit the country months ago. This Google’s initiative spawned two capable devices – the Cherry Mobile One and the MyPhone Uno. The former is originally priced in Php 3,999 and the latter just joined the Php sub-4K category. The MyPhone Uno will not disappoint those who are looking for a legit entry-level Android handset. It packs a 4.5-inch FWVGA display and 1.3GHz quad-core processor coupled with a gigabyte of RAM for smooth multitasking. Camera-wise, the MyPhone Uno sports 5MP/2MP camera combination. Across the board, you can house your multimedia files on a 4GB internal storage. It also supports up to 32GB via microSD card slot. The phone is only limited to 3G connectivity for mobile internet and 1700mAh to power the device. However, the device runs on Android 5.1 Lollipop out-of-the-box. With this phone, you can always get the latest Android OS update from Google. The MyPhone Uno is a great deal for kids who are going back to school from their summer vacation. The handset’s rugged appeal complements kids’ sports apparels. For those of you who don’t have the luxury of time to go to the nearby mall, you can shop for sportswear online at ZALORA Philippines in your MyPhone Uno handset.